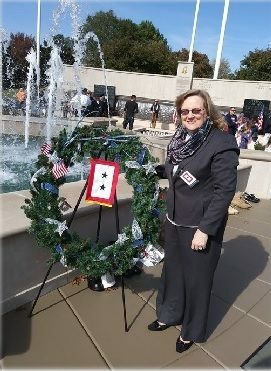 South University, Montgomery staff member Kathleen Clements was honored as a Blue Star Family Member during a local Veterans Day celebration. Blue Star Family Members have active duty military family members currently serving in the armed forces. Clements has two sons who serve in the U.S. Air Force. Major Patrick Clements is stationed at Lackland Air Force Base in San Antonio, Texas and 1st Lieutenant Christopher Clements serves at McConnell Air Force Base in Wichita, Kansas. Ms. Clements was honored during a Veterans Day Military Appreciation breakfast in Huntsville, Alabama. Programs, credential levels, technology, and scheduling options vary by school and are subject to change. Not all online programs are available to residents of all U.S. states. South University, Montgomery, 5355 Vaughn Road, Montgomery, Alabama 36116 © 2017 South University. All rights reserved. Our e-mail address is materialsreview@southuniversity.edu. See suprograms.info for program duration, tuition, fees and other costs, median debt, salary data, alumni success, and other important info.